In this month of July, when nationally we are celebrating the celebrating the 75th anniversary of one of the British railway industry’s greatest achievements – the world speed record of LNEW streamliner Mallard – we too have been able to enjoy with immense pleasure, the return of steam to our part of Lincolnshire. So it was, on Saturday, that The Railway Touring Company of King’s Lynn ran the Jolly Fisherman charter train hauled by BR Standard Class 7P 4-6-2 No 70013 Oliver Cromwell (photo above by Paul King), from London King’s Cross to Skegness. I was fortunate to be one of those on the train, which I joined at Peterborough. As soon as I heard that chime whistle I was transformed back in time to Crewe Locomotive Works where Oliver Cromwell was built and entered service in May 1951. The famous Jolly Fisherman poster was drawn up by John Hassall in 1908, following commission by the Great Northern Railway. It is probably the most famous holiday poster ever drawn and the original is now hung in Skegness Town Hall. It was also extremely appropriate that our return route was on the East Coast main line south from Grantham to Peterborough following what was regarded as the race track in steam days, where Mallard achieved 126 mph just before Essendine on July 3, 1938. To return to our own more rural parts of the outward journey, enthusiasts and onlookers alike chose various vantage points to photograph or just admire. We passed non-stop through Spalding where people had congregated at Hawthorn Bank crossing and at the station. At Gosberton they gathered at the recently disused signal box at Blotoft. At Sleaford there was probably the largest turnout where Oliver Cromwell received water from a Fire Brigade bowser. 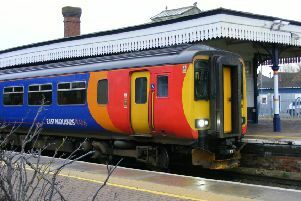 People were on the stations at Heckington, Swineshead and Boston - in particularly in considerable numbers at Broadfield and West Street crossings and at the station itself. North of Boston the many vantage points included the middle of a potato field and a tripod on the back of a trailor. Finally, at Wainfleet, about 50 passengers left the train for a pre-arranged visit to Bateman’s Brewery. In conclusion, I hope that all of you who turned out got as much pleasure as I did, but the almost oppressive heat of the day was a real factor to cope with. Perhaps with hindsight, we should all have got off at Wainfleet.